Most of the vegetarians I know are healthy people (especially compared to the general public). They get loads of fiber, avoid processed foods, and get exercise by riding their hipster bikes to work. Being “healthier” doesn’t have to involve such drastic steps though. Here are 3 incredibly easy ways to be a healthier vegetarian. Even if a product carries the “V” for Vegan label, you should still read the ingredients. Lots of manufactured vegan foods are full of unhealthy junk like refined sugars, hydrogenated oils, and artificial flavors. For example, Gimme Lean sausage has hydrolyzed soy protein and hydrolyzed corn protein (you can read about these disgusting ingredients here). Reading the ingredients on the foods you eat helps you stay informed so you are better able to make healthy choices. Assuming that you are already drinking your much-needed 3+ liters of water daily, you could do your health even better by adding lemon juice to your glasses of H20. 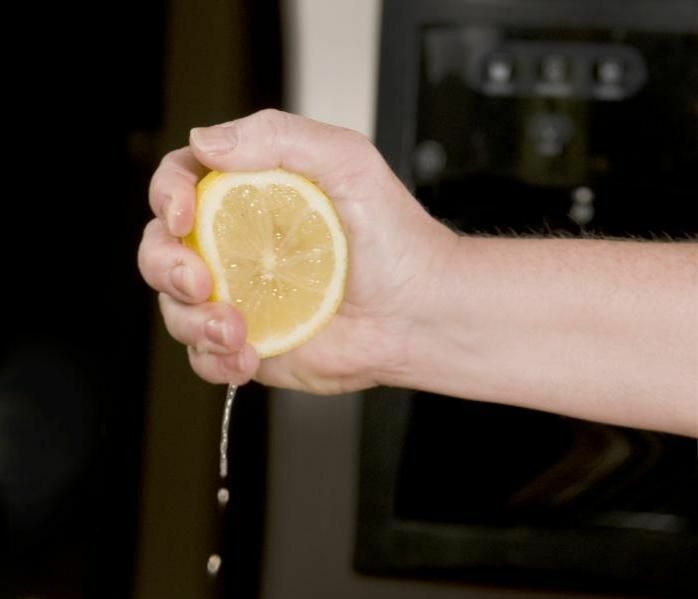 Lemon juice is packed with vitamin C, which is notorious as an immune-system booster. But vitamin C has many more benefits than this! Vitamin C helps protect against oxidation, thus keeping your cardiovascular system healthier and protecting you against heart disease. Studies have shown that vitamin C helps prevent cancer, reduces inflammation (thus helping asthma), and helps healing by promoting collagen production. Vegetarians can also benefit from vitamin C because it helps increase iron absorption. Since vegetable sources of iron (called non-heme iron) aren’t absorbed as well as animal sources of iron (heme iron), adding lemon juice to your water can help prevent anemia. Do keep in mind though that vitamin C can block the absorption of some other nutrients, namely zinc, copper, manganese and calcium. However, this is only worrisome when incredibly high amounts of vitamin C are taken (such as when sick people go crazy with the vitamin C supplements). Plus, lemons do contain zinc, copper, manganese and small amounts of copper. So, lemon juice beats a vitamin C supplement any day! I know it is annoying when omnivores ask you “but how do you get enough protein?” — as if meat were the only source of protein! But the truth is that it isn’t always easy to get complete proteins as a vegetarian. Complete proteins are the ones with all your essential amino acids — and there aren’t too many vegetarian proteins which are complete (though hemp seeds are one good example). There is no need to worry though. You can easily get all your amino acids just by diversifying your protein sources. Instead of just relying on tofu or beans for dinner as your daily protein, start including some protein in every meal. This is surprisingly easy – like adding a handful of walnuts to your morning cereal and a scoop of sunflower seeds to your afternoon salad. Delicious salad with sunflower seeds for extra protein! A lot of vegetarians I know take supplements as a way of ensuring they get all their nutrients. Multivitamins seem to be the most popular choice because of their convenience, but there are some problems with taking all your supplements in one dosage. Namely, some nutrients block the absorption of others. For example, calcium blocks iron because they both use the same transporter system in the intestines. Since calcium and iron are so important for vegetarians, these supplements should be taken at separate times. You’ll also want to avoid any of those supplements which have mega-high dosage amounts. It is just a waste of your money because you will pee out most of the vitamins (which is why your pee probably looks fluorescent after taking B complex!). I solve this problem by breaking my large-dosage tablets in half and taking one half with breakfast and the other with dinner. According to a study published in Scientific American, only 23% of Americans are getting enough vitamin D. For vegetarians and vegans, the risk of vitamin D deficiency may be even higher because few plant-based products naturally contain vitamin D.
Without adequate vitamin D, people can suffer from bone density loss (a problem which greatly affects vegans) and muscle loss. Vitamin D can be synthesized by the body from sun exposure. The problem is that we are spending increasingly more time indoors. One study found that people on average only spend 1-2 hours outdoors in the summer. Considering the fact most of us become hermits during the winter, I’d suspect that the averages drop to about 30 minutes in January! Your body can’t produce vitamin D from sunlight shining through windows. So improve your health by getting outside more often! Here is one way to get outdoors more!